I used to find color codes which I want to use for texts or background colors on htmls with color edit tool of MS paint which pre-installed on Windows. But now I use Mac instead of Windows. How can I find color codes with Mac? Is an software like MS paint pre-installed on Mac? 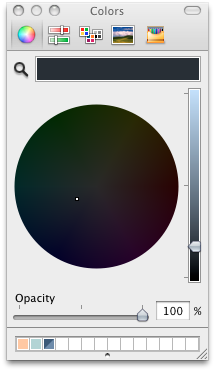 There is a utility (in Applications/Utilities) called Digital Color Meter, which shows the color code of whatever you're hovering at the moment. It's a bit more lightweight than Preview. There are also shortcuts for copying the color value as a string (⇧+⌘+C) or image (⌥+⌘+C). The Digital Color Meter in /Applications/Utilities/ is the best choice. This picker is almost everywhere if you look carefully. Look closely at font controls and you will likely see wording like Format -> Font -> Show Colors, or Format -> Show colors. (The shortcut is usually ⇧⌘C). You will get the small color panel shown above, where you can click the "magnifying lens" and you can grab the color from anywhere in the screen. for example: TextEdit, Pages, Mail etc... This is a clipboard to save colors, but doesn't report hex values, CIE values or the ITU-R Y'PbPr/Y'CbCr values for the chosen color. Everywhere when you can show the font panel (usually ⌘T), you can click the "Text color" icon in the font panel and you will get again the "Color panel" (with picker). You can for example when entering text into textbox here, right click for bring up contextual menu, and go to "Font -> Show colors" directly from the Safari... This works in every application where you can change fonts. 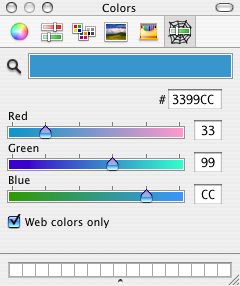 You can download a some cool color-helper dasboard widgets, like: colourmod or ColorTheory. 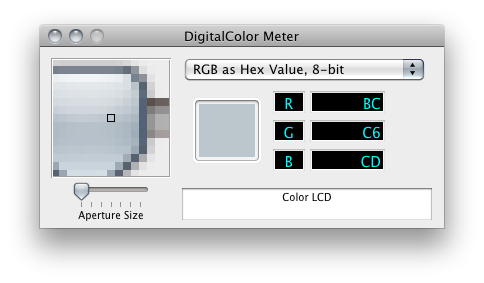 You can download a plugin into color panel for hexadecimal color values. 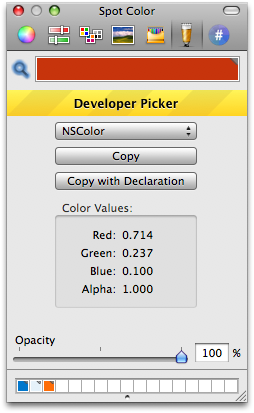 If you find yourself needing the DCM often, you might look at using Automator.app to create a global "Service" that launches the Digital Color Meter.app. Now you are a few clicks away and can additionally bind this new service to a global hotkey in the System Preferences. The result: running DCM from anywhere, anytime, on a custom key command. I quite like the completely-free app Spot Color. It uses the Mac's built-in color pickers and allows you to grab the color and then use the various sliders and color models to modify it, as you asked about in your followup comment. It is a free app in the app store. It does the job for web developers! Just press "Alt + X" to freeze the value under your mouse. 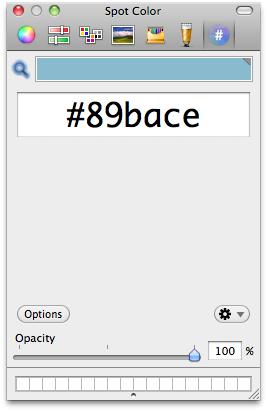 By default, it picks the value as hex decimal code, like #F7F8F9 for instance. Very simple and straight to the point. Love it. Great app! I have it on both Windows and Mac - works like a charm.. There is an App called Preview pre-installed where you can get the colors from. Not the answer you're looking for? 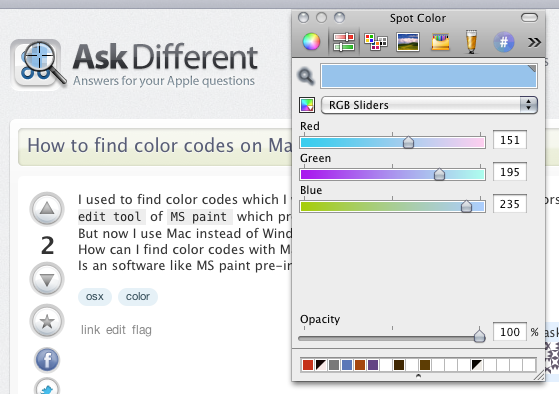 Browse other questions tagged macos color . 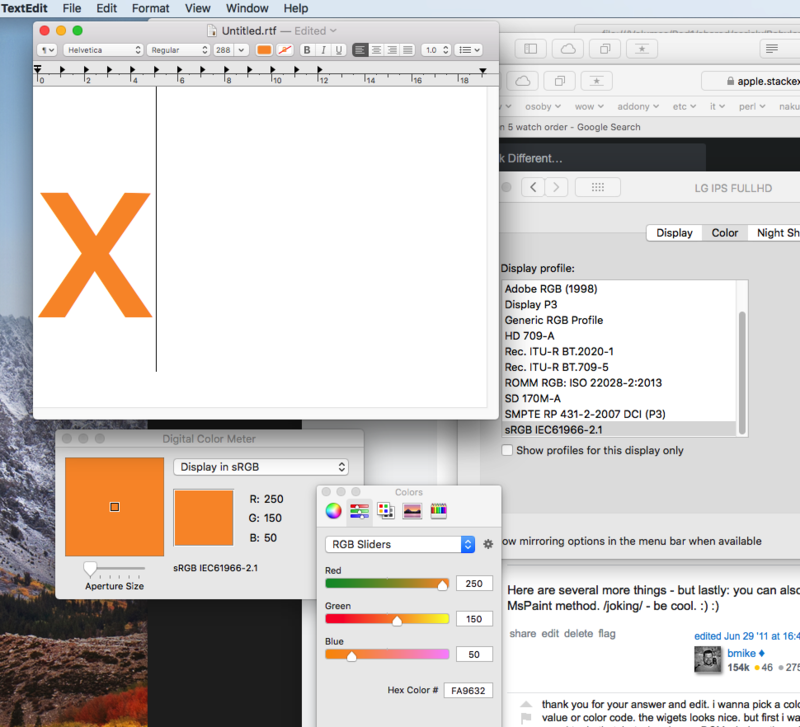 HEX Code in Color Chooser for Mavericks? How can I adjust the apparent color temperature of my display in OS X? Green color not so green on my mac? How to Get a Similar color as LightSteelBlue3 in El Capitan? Looking for an app to name colors on Mac (colorblind)? How can I disable color management on OS X?